Wat Doi Suthep is a Buddhist Temple, situated in Doi Suthep-Doi Nathional Park, just outside of Chiang Mai. We decided to visit this temple at the weekend after hearing so much about the views from the top. We walked to the Chiang Mai zoo from Chiang Mai city centre, which took around 40 minutes. Then we got a Red Taxi (Shared taxi-which is the main source of transport around Chiang Mai) from the zoo-which cost us 40 Baht each (£1) for a 20 minute journey up a steep winding road, which took us about 1,600 m above sea level. The taxi dropped us at the foot hill of the temple. We prepared ourselves for the 304 steps that we had to climb to get to the top of the temple. There is the option to get a train up, but we decided to take the difficult path, as always! It was worth it-to see the view over the city from the top. 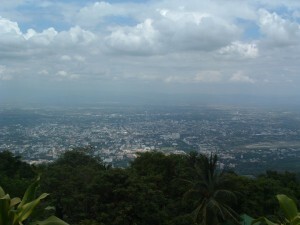 You can see over the whole city and over the forests of Doi Suthep National Park. 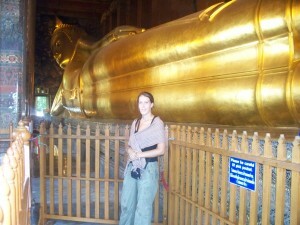 The entrance fee into the temple is 30 baht for foreigners (65p). Like all temples you have to make sure you are dressed respectively, covering shoulders and wearing long trousers. 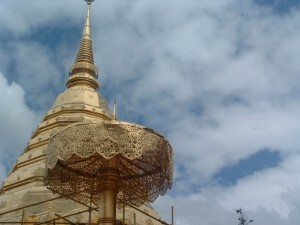 Wat Doi Suthep was founded in the 14th Century but has been renovated many times since. Unfortunately it was in the middle of being renovated when we were there, so we weren’t able to get the best photos. When we got to the temple, there was a young Thai band playing music, and young dancers. We sat and enjoyed the music and looked over the view of Chiang Mai city! We got the bus from Chiang Mai to Bangkok today and will be getting a flight tomorrow to Hong Kong. Thailand is a beautiful country which we will miss very much! We practically enjoyed our time in Chiang Mai, and will miss the city and the beautiful people. I’m sure we will be back one day though! It is hard getting back on the road when you have stopped for such a long time, but we are excited about discovering a new country and meeting new people. We left for Bangkok on Wednesday 21st April. Ning took me to get our bus ticket from Chiangmai to Bangkok a couple of days before. We got our ticket for 600 Baht (£12) each. This is 250 Baht (£5) cheaper than we paid getting to Chiangmai from Bangkok. You get charged more when you go to a tour office, as they take a commission and will charge you as high as they can. Our mistake was that we didn’t look around more. When you are rushing to get a ticket it’s difficult though. Most of the time they will always drop their price, so there’s no harm in trying! We left Chiangmai at 7.00 am and arrived in Bangkok at 5pm. The bus was really comfortable. We were served food and drinks throughout the journey and stopped half way to get a meal in a restaurant, that was included in the price. They didn’t have any vegetarian option though so I just had a plate of rice. We stayed in the @Hua Lamphong hotel. We stayed here last time we were in Bangkok and were really happy with it. The staff are so friendly and helpful and the rooms are beautiful and very comfortable. The hotel has wifi and a Cafe. The staff in the cafe are extremely friendly and give you the best service! We were really impressed with this hotel and would definitely stay there again, if we return. We only stayed in Bangkok for 4 nights. It is quite crazy in Bangkok at the moment because of the protests, so it wasn’t worth risking anything by going out. A lot of the streets are blocked by baracades made of car tires and sharpened bamboo. We were there when the blasts happened, just around the corner from our hotel. Luckily we were safe in our hotel that night. We took a bus from Bangkok to Siem Reap in Cambodia on Sunday 25th April 2010. We will write about that journey in our next Blog. We had a fantastic time in Chiangmai. I have always wanted to go, after hearing many stories from my Dad and I was more than impressed. The people are so friendly and Chiangmai city has so much character. It is both modern and cultural at the same time. 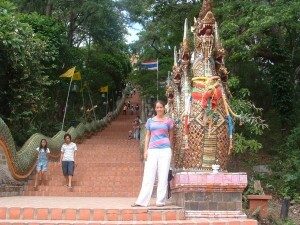 There is so much to see around Chiangmai that we were unable to do everything in 2 weeks. We definitely want to return! We would of liked to see Chiang Rai and more of the surounding areas. We also want to return to the Lisu Village to spend more time there and maybe stay over in the village. It was especially good having Suriya and Ning to show us around. You really get to see a more ‘real’ side of a place when you are with locals. They took us to local restaurants, local super markets and local attractions. 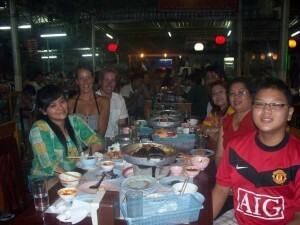 We went out for dinner with Ning and her family one night, to a large local restaurant. You all get a heater in the middle of your table and you go and select what meat, vegetables, noodles, sauces ect that you want and cook it on the heater. This is a really nice way of lengthening your meal out and socializing at the same time. There was so much choice of meat and fish, so that wasn’t so good for me, being a vegetarian, but it was still fantastic! We really enjoyed being surrounded by the locals and eating like they do, and tasting Thai food in it’s true form. Ning was explaining that alot of the Thai food in the tourist restaurants is nothing like traditional Thai food. You could eat as much as you wanted at the restaurant. You just keep going back and cooking more food up! The total of the food for all 8 of us was roughly the same price as a meal for 2 in a tourist restaurant. So it’s best to eat with the locals or at least in the local restaurants! If you can find them that is. They are never in the tourist areas, you need to go a little bit out. Favourite Day out: Hill Tribes, Elephant Riding on Mae Ping River. 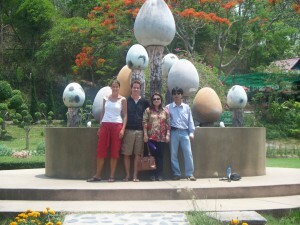 On Friday 16th April 2010, we went to visit some hot springs with Ning and pi Toiy, a friend who works with Ning. Alot of locals go here to bathe their feet into the hot springs, and some even get fully in. This seems crazy in the heat! I managed to slowly put my feet into the water, but I found it too hot to keep it in their for too long! We looked around for a while and then went for lunch together. On the way back we went to visit some shops. We went to see where Silk is made. First we went to a demonstration room, where you can see them making the silk on the machines. They have to concentrate so much as they have to count how many of each colour they have done, and keep count of the changes in the pattern. After watching them weave scarfs we went to look around the shop. You can purchase several things like scarfs, bedding, clothing, table matts and small sovouneirs. We then went to see where bamboo umberellas are made. 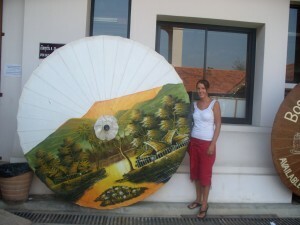 The umbrella frames are made completley of bamboo and the cover is decorated with different paintings. We saw many beautiful things in the shops, but we had to resist! We can’t carry that much backage around! Plus we would soon run out of money if we kept buying.